Creating with Christine: Summer Crush Special! During the month of June, when you purchase any My Crush™ book and its accompanying assortment pictured in the 2014-15 Annual Inspirations catalog, you will receive the coordinating stamp set for FREE! That is a savings of at least $9.95! Choose from five lovely My Crush book offerings that will provide a swoon-worthy background for your favorite memories. From family reunions to camping adventures to holiday countdowns—and much more—you will be crushing on all these books and the possibilities they provide. Every My Crush book also features perfect bases for your memory keeping. 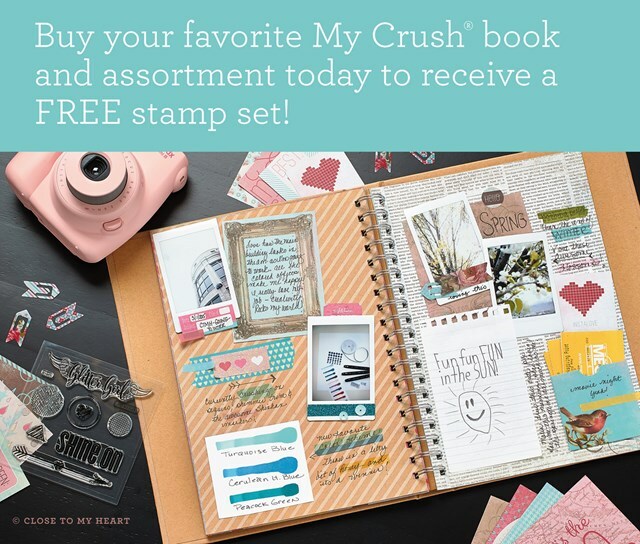 Additionally, each My Crush book also features unique details—from glossy print, to vellum pages, to gold foil, to ink-resist patterns—that make displaying your personality easier than ever. Plus, once you add the artistry of the coordinating assortments featuring sticker sheets, envelopes, alphabets, cards, and journaling spots, along with your free stamps etc, you will be well on your way to your own gorgeous mini book creation! This offer is only available while supplies last and once they’re gone, these books will be gone for good, so get your order in early to get your summer romance rolling today! Click here or on the image below to order your My Crush goodies.